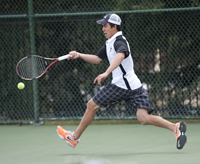 Small in number, the Wood River High School tennis team was large in accomplishment Friday and Saturday during the State 4A tournament at Timberline High School and Julia Davis Park in Boise. Wood River’s seven state qualifiers piled up 36 team points over two days to place second in the overall 4A team standings behind only Century of Pocatello (48) in the field of 21 schools. Last year’s 12 Wolverine qualifiers also came up with a total of 36 points. Juniors Andrew Pearson and Haley Cutler of Wood River made the championship match of 4A mixed doubles and won Wood River’s 21st state event championship—17 in doubles—with a 6-3, 3-6, 6-4 victory in the title match. The tiebreaker was a team’s number of entries in the championship round. Wood River had Pearson and Cutler, and Kuna ended up with none. Cutler has become a constant for Wood River at state. Saturday’s final at Julia Davis Park was Haley Cutler’s third time playing for doubles placement at state tennis. She has come away with three victories in the three tries, all with different partners. Two years ago, Cutler as a freshman placed third in mixed doubles with senior Quentin Dowdle—winning their final match 7-6, 2-6, 7-5. Last year Cutler captured the state girls’ doubles title with senior Margaret Reutter. And this year, she went 4-0 with Andrew Pearson. All told, Cutler is 12-1 in her 13 state matches—losing only to eventual 2012 mixed doubles champions Jimmy Harrison and Ariana Tobe of Bishop Kelly. She wasn’t going to let Wood River lose in last weekend’s pivotal match—Saturday’s semi-final eye-opener against the strong Columbia twosome of senior Eric Mitchell and sophomore Kiana Zamudio from Nampa. Tight as a drum and just missing their shots in their 6-3 first-set loss, Cutler realized that hard-hitting Mitchell offered a challenge with his solid play at the net. So she started lobbing her returns to the backcourt. Many of those returns sailed long and out in the early stages of the match. Midway through the second set, Cutler and Pearson started getting into a rhythm and building their confidence and momentum. They won on Mitchell’s powerful serve and took the second set 6-4. The Wood River players broke the serves of Zamudio and Mitchell for a 3-0 lead in the decisive third set. Pearson, a tower of strength in the final two sets, rallied from a double fault to push Hailey ahead 4-2 with Cutler smashing the winner at the net. The teams went to deuce twice on Mitchell’s serve, then Cutler made a great drop shot and lob, 5-2. It was all over but the shouting when Cutler went ahead 30-0 on her serve, but Columbia battled back and the Wolverines needed an excellent return from Pearson to finish off the Wildcats 6-2. Cutler and Pearson met the experienced Nampa High School team of juniors Nick Hughes and Kassie Tuttle in the championship match and put together a 6-3, 3-6, 6-4 win. Meanwhile, the Taylor sisters won their first two matches in split sets, and lost to eventual girls’ doubles runner-up Kennedy and Laney Search, sisters from Sandpoint. The Taylors then won their final two matches in straight sets for third place. Wood River seniors Stephen Pfeiffer and Andrew Graves earned four important points in boys’ doubles by winning three matches sandwiched around a straight-set setback to eventual state champions Tanner Norton and Jacob Harris, Blackfoot seniors. Final overall team totals (state qualifiers in parentheses): 1—Century of Pocatello (9) 48 points. 2—Wood River (7) 36. 3—Bishop Kelly of Boise (8) 31. 4—Kuna (5) 31. 5—Blackfoot (12) 26. Boys’ team standings: 1—Bishop Kelly of Boise 30 points (18th state title). 2—Blackfoot 22.5. 3—Canyon Ridge of Twin Falls 21. 4—Middleton 16. 6—Wood River 14. Girls’ team standings: 1—Century of Pocatello 36 points (3rd state title). 2—Skyview 24. 3—Wood River 22. 4—Kuna 22. Boys’ singles: Championship—Cole Hunt (Canyon Ridge sophomore) 6-1, 3-6, 7-6 over Elliott Klein (Bishop Kelly sophomore). Third place—Ian Fisher (Caldwell senior) 6-0, 6-1 over Brandon Calley (Kuna sophomore). Girls’ singles: Championship—Amy Agenbroad (Skyview senior) 6-4, 6-4 over Ella Wathne (Century sophomore). Third place—Becca Perry (Kuna senior) 6-3, 6-0 over Beckah Farris (Kuna sophomore). Boys’ doubles: Championship—Tanner Norton-Jacob Harris (Blackfoot seniors) 7-6, 6-2 over Cache Wood-Emry Wood (Middleton senior, freshman). Third place—Joey Harrison-Nick Tobe (Bishop Kelly seniors) 6-4, 7-5 over Hunter Mansfield-Kade Sutton (Century sophomore, junior). Girls’ doubles: Championship—Alex Kempf-Sydney McRoberts (Century juniors) 6-0, 6-2 over Kennedy Search-Laney Search (Sandpoint senior, freshman). Third place—Alexandra Taylor-Samantha Taylor (Wood River senior, sophomore) 6-4, 6-4 over Haley Hilton-Lauren McKinnon (Caldwell seniors).